Wolfgang Gullich climbing in Frankenjura (DEU). 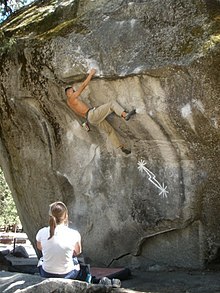 In free climbing, a first ascent (FA), or first free ascent (FFA) is the first successful, documented climb of a route or boulder performed without using equipment such as anchors, quickdraws or ropes for aiding progression or resting. In this article, notable first free ascents of hard routes and boulders are listed, which are regarded worldwide as milestones in the history of free climbing. Ratings on the hardest climbs tend to be speculative, until other climbers have had a chance to complete the routes and a consensus can be reached on the precise grade. This becomes increasingly difficult as the grade increases, because fewer climbers are capable of repeating the route and passing judgment on its grade. The hardest ascended route (Silence) has a proposed grade of 9c (5.15d). It was first ascended by Adam Ondra in 2017 and no one else has yet repeated it. The hardest route ever ascended by a woman is La Planta de Shiva, graded 9b (5.15b). Angela Eiter claimed its first female ascent in 2017 and no other woman has yet repeated it. The hardest ascended boulder problem (Burden of dreams) has a proposed grade of 9A (V17). It was first ascended by Nalle Hukkataival in 2016 and no one else has yet repeated it. The hardest routes ever successfully climbed on-sight are graded 9a (5.14d). The first on-sight ascent of a 9a (5.14d) route (Estado Critico) was claimed by Alex Megos in March 2013. The second (Cabane au Canada) by Adam Ondra in July 2013. No one else has yet onsighted this grade. Silence (formerly known as Project Hard) - Flatanger (NOR) - September 3, 2017 - First ascent by Adam Ondra, who described it as "much harder than anything else" he had previously done, and cautiously suggested the 9c rating. The route is about 45 m long. The first 20 m are about 8b (5.13d), followed by three distinct boulder problems: an extremely hard 8C, a "burly 4-move" 8B and a 7C+ with slippery feet. The first of these was described by Ondra as the hardest 8C (V15) he ever climbed. It consists of 10 incredibly hard and unusual moves, including single-finger locks, climbing upside down and a variation of a figure four move. La Dura Dura - Oliana (ESP) - February 7, 2013 - First ascent by Adam Ondra. Route bolted by Chris Sharma, who repeated the ascent one month later and confirmed the grade. Perfecto Mundo - Margalef (ESP) - May 9, 2018 - First ascent by Alexander Megos. Second ascent on December 7, 2018 by Stefano Ghisolfi, who confirmed the grade. Route bolted by Chris Sharma. By climbing it, Megos and Ghisolfi became the third and fourth climbers in history to redpoint at this grade. Akira - Vilhonneur cave (Périgord, FRA) - June 06, 1995 - First ascent by Fred Rouhling. He proposed a grade of 9b (5.15b), but the route is still unrepeated and its grade is not confirmed. Chilam Balam - Villanueva del Rosario (ESP) - July 4, 2003 - Unconfirmed first ascent claimed by Bernabè Fernandez. He proposed a rating of 5.15c (9b+) but the route was later repeated by Adam Ondra, who graded it as a "low end" 5.15b (9b). Jumbo Love - Clark Mountain (Mojave National Preserve, USA) - September 11, 2008 - First ascent by Chris Sharma. Widely considered the world's first 9b[by whom?]. This route is 250 ft long (76 m). Sharma has called it his hardest ascent to date. In climbing it, he skipped up to three clips in a row due to the difficult sequences, which resulted in falls of 70 ft (21 m) or more. Repeated by Ethan Pringle, May 2015. Open Air - Schleier Waterfall (AUT) - 1996 - First ascent by Alexander Huber, who initially proposed a 9a rating. Heralded as the world's hardest route upon completion, the route was first repeated twelve years later by Adam Ondra, who upgraded it to 9a+, trying to fit the grade to the "new school" rating conventions. According to Alexander Huber, the route is at least as difficult as La Rambla, first climbed by him in 1994. Those who doubt that the original version of La Rambla is 9a+ (including Huber), might consider Open Air to be the first 9a+ in history. Biographie - Montagne de Céüse (FRA) - July 2001 - First ascent by Chris Sharma. Heralded as world's first 9a+ upon completion, because at that time Huber's Open Air was still considered to be a 9a route (see above). La Rambla Extension - Siurana (ESP) - 41 metres (135 ft) long extended version of Alexander Huber's route La Rambla, obtained by Dani Andrada by linking Huber's route to another route nearby, via a traverse - March 8, 2003 - First ascent by Ramón Julián Puigblanque, after more than forty failed attempts. Puigblanque proposed a 9a+ rating, later confirmed by many other repeaters. Action Directe - Frankenjura (DEU) - 1991 - First 9a in history, by Wolfgang Gullich. Still described as one of the hardest routes worldwide. Originally graded 8c+, it is now widely considered to be a challenging 9a. La Rambla - Siurana (ESP) - 1994 - First ascent by Alexander Huber, who graded it 8c+ (5.14c). Based on its similarity with La Rambla Extension, a 6 metres (20 ft) longer version of the same route, La Rambla might be considered to be the world's first 9a+, but Huber would probably disagree. In his opinion, both routes are "not harder than" Wolfgang Gullich's Action Directe, the word's first 9a, which in 1994 was still rated 8c+. 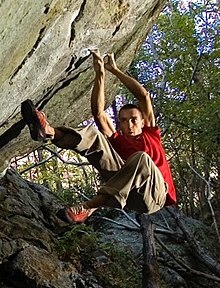 In 2003, Ramón Julián Puigblanque climbed both routes and graded them 9a+. Since the additional 6 meters of La Rambla Extension were much easier than La Rambla's crux, Puigblanque believed that they did not increase the difficulty of the ascent enough to justify an higher rating. Bain de Sang Saint-Loup (Pompaples, SUI) - First ascent by Fred Nicole, 1993. Third 9a route in the world. Hubble - Raven Tor (GBR) - June 14, 1990 - First 8c+ in history, by Ben Moon. Due to failed attempts from some of the world's best climbers, upgrading to 9a was suggested. However, Alex Megos, after repeating it in 2016, stated that this was neither one of his hardest, nor one of his easiest 8c+ routes. Wallstreet - Frankenjura (DEU) - 1987 - First 8c in history, by Wolfgang Gullich. Ravage - Basel (CH) - 1985 - First 8b+/c in history, bolted by Wenzel Vodicka but first ascended by Antoine Le Menestrel. Repeated in 2009 by Adam Ondra and in 2017 by Alex Megos. Punks in the Gym - Mount Arapiles (AUS) - 1985 - First 8b+ in history, by Wolfgang Gullich. Kanal im Rücken - Frankenjura (DEU) - 1984 - First 8b in history, by Wolfgang Gullich. La Planta de Shiva - Villanueva del Rosario (ESP) - October 22, 2017 - World's first female ascent of a 9b route, by Angela Eiter. First ascent by Adam Ondra in 2011. The grade was confirmed by Jakob Schubert in 2016. La Rambla Extension - Siurana (ESP) - February 26, 2017 - World's first female ascent of a 9a+ route, by Margo Hayes. First ascent by Ramon Julian Puigblanque in 2003 (see above). The grade was confirmed by many repeaters. Bain de Sang - Saint Loup (SUI) - October 29, 2002 - World's first female ascent of a 9a route, by Josune Bereziartu, after 15/20 trials. First ascent by Fred Nicole in 1993. Third 9a route in the world. The grade was confirmed by many repeaters. 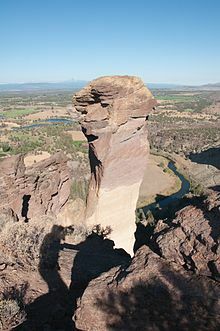 The east face of Monkey Face at Smith Rock, containing Just do it (8c+), onsighted by Ondra in 2018. When it was first ascended by Tribout, in 1992, Just do it was considered the hardest route in the USA. Estado Critico - Siurana (ESP) - 24 March 2013 - First 9a onsight in history by Alex Megos. Il Domani - Baltzola (ESP) - 3 May 2014 - by Adam Ondra. Bizi Euskaraz - Etxauri (ESP) - December 11, 2007 - First 8c+ onsight in history by Patxi Usobiaga. Project by Ekaitz Maiz. Kidetasunaren balio erantsia - Etxauri (ESP) - 6 March 2011 - Second 8c+ onsight in history, by Adam Ondra. Just Do It - Smith Rock (Oregon, USA) - November 12, 2018 - First ascended onsight by Adam Ondra. Bolted by Alan Watts in 1989 and first ascended in 1992 by Jean-Baptiste Tribout. Although this is the twentieth 8c+ route onsighted by Ondra, it is mentioned herein because it is USA’s first 8c+. Moreover, it is a particularly long slab (140 feet, 18 bolts) plenty of tricky moves, with small holds, hardly visible from the ground. This kind of classic routes is considered to be particularly difficult to onsight, by both Alan Watts and Adam Ondra. White Zombi, Baltzola Cave (ESP) - October 6, 2004 - World's first 8c onsight, by Yuji Hirayama. There are few climbers who have free-soloed in the 5.14 grade range. This list does not include "highball" boulder ascents because the climbers here did not use any padding or spotters. There is some debate on the blurred line between "highball" bouldering and short free solo climbs. Darwin Dixit - Length: 15 metres (49 ft) - Margalef (ESP) - March 2008 - The first 8c free solo, by Dave MacLeod. Kommunist - Length: 22 metres (72 ft) - Tyrol (AUT) - 2004 - The first 8b+ free solo, by Alexander Huber. Le blond - Oliana (ESP) - Project by Chris Sharma, immediately to the right of La Dura Dura (world's first confirmed 9b+). Named after Patrick Edlinger, who passed away while Sharma was bolting the route. Alasha - Mallorca (ESP) - September 12, 2016. First ascent by Chris Sharma, who estimated its grade based on the effort it took to climb it without rope: "If it had bolts on it, it probably wouldn’t be a 9b (5.15b). But when you’re 60 feet up with no bolts, it takes the same amount of effort.” Sharma named the route after his daughter, Alana Sharma. Es Pontàs - Mallorca (ESP) - September 26, 2007. First ascent by Chris Sharma. Repeated by Jernej Kruder in November 2016. It features a 7 feet (2.1 m) dyno that took Sharma over 50 attempts to stick. The Dawn Wall - El Capitan (Yosemite, USA) - Height: 3,000 feet (915 meters) - 32 pitches, at least two of which graded 9a (5.14d). Described as the hardest big wall in the world. January 14, 2015 - Redpointed by Tommy Caldwell and Kevin Jorgeson in 19 days, after 7 years of practicing. November 21, 2016 - Redpointed by Adam Ondra in only 8 days, after a few weeks of practicing. Ondra was the first person to lead every pitch. The Nose - El Capitan (Yosemite, USA) - Height: 3,000 feet (915 meters) - 31 pitches, one of which is graded at 5.14a/b. Described as one of the most important ascents in climbing history. 1993 − First to free climb, Lynn Hill with partner Brooke Sandahl. Was not repeated for 10 years after their ascent. Burden of Dreams - Lappnor (FIN) - October 2016 - Grade proposed by Nalle Hukkataival after several years of trials. During these years, Hukkataival "very quickly" solved several 8C and 8C+ boulder problems throughout the world, including Gioia (see below). Compared to these other problems, Burden of Dreams felt "way way harder". Gioia - Varezze (ITA) - 2008 - First ascent by Italian boulderer Christian Core, who first proposed 8C, "to play things safe". In 2011, Adam Ondra repeated the ascent and wholeheartedly proposed the 8C+ grade, describing the boulder as one of the hardest in the world, together with Terranova (see below). Terranova - Holstejn (Moravsky Kras, CZE) - 10 November 2011 - First ascent by Adam Ondra. The story of two worlds - Cresciano (SUI) - January 2005 - First confirmed 8C in history, by Dave Graham. Five years earlier, Fred Nicole had proposed 8C for Dreamtime, on the other side of the same boulder, but most repeaters downgraded it to 8b+ (see below). The Game - Boulder, Colorado (USA) - 2010 - First ascent by Daniel Woods, who originally graded it 8C+ (V16). Second ascent in 2013 by Carlo Traversi, who proposed 8C (V15). Lucid Dreaming - Bishop, California (USA) - 2010 - First ascent by Paul Robinson, who initially graded it 8C+ (V16), and later downgraded it. In 2010, together with The game (see above), this was considered to be one of the world's most challenging boulders. Second ascent by Daniel Woods, who confirmed the 8C (V15) grade. Dreamtime - Cresciano (SUI) - October 28, 2000 - First ascent by Fred Nicole, who proposed an 8C rating, making it the first unconfirmed 8C boulder in history. In 2002, Dave Graham repeated it by finding a different solution. He used a heel-hook to make the brutal start sequence easier, and downgraded the problem to easy 8b+. Most of the following repeaters, including Adam Ondra, Chris Sharma, and Daniel Woods adopted Graham's solution and agreed with him about the grade. Notable exceptions are Jan Hojer and Christian Core, who confirmed the 8C rating. Midnight Lightning - Camp 4 (Yosemite National Park, USA) - 1978 - First ascent by Ron Kauk. First female ascent by Lynn Hill, 1998. 39 years after its solution, it has been described as one of the world's most famous bouldering problems, together with Dreamtime (see above). ^ a b planetmountain.com, ed. (September 4, 2017). "Interview: Adam Ondra climbs world's first 9c at Flatanger in Norway". Retrieved September 4, 2017. ^ a b Planet Mountain (ed.). "Interview with Angela Eiter, the first woman to climb 9b". Retrieved 24 October 2017. ^ a b Planet Mountain (ed.). "Angela Eiter climbs historic first female 9b". Retrieved 23 October 2017. ^ a b Planet Mountain (ed.). "Nalle Hukkataival climbs Burden of Dreams and proposes world's first 9a boulder problem". ^ a b "First 9A onsight by Alex Mesgos". ^ a b Björn Pohl (9 July 2013). "La cabane au Canada, 9a, onsight by Ondra". ukclimbing.com. Retrieved 10 July 2013. ^ Adam Ondra. "Silence 9c, Flatanger, Norway". Instagram. ^ "Adam Ondra climbs world's first 9c - Project Hard". UKClimbing. Retrieved September 3, 2017. ^ planetmountain.com, ed. (June 26, 2017). "Interview: Adam Ondra climbing toward the world's first 9C". Retrieved August 1, 2017. ^ Youtube, ed. (September 14, 2016). "Adam Ondra: incredible moves in possible 9c". Retrieved August 1, 2017. ^ Youtube, ed. (September 14, 2016). "Adam Ondra trying the first crux of Project Hard". Retrieved August 1, 2017. ^ Youtube, ed. (September 14, 2016). "Adam Ondra on the second crux of Project Hard". Retrieved August 1, 2017. ^ climbing.com, ed. (June 7, 2016). "Adam Ondra: the future of climbing". Retrieved August 1, 2017. ^ Dougald MacDonald (4 October 2012). "Adam Ondra Climbs 5.15c in Norway". Climbing. Retrieved 7 October 2012. ^ "Ondra Puts Down La Dura Dura (5.15c)". Climbing. Retrieved 7 February 2013. ^ planetmountain.com, ed. (May 9, 2018). "Alexander Megos frees Perfecto Mundo 9b+ at Margalef". Retrieved May 9, 2018. ^ Instagram, ed. (December 7, 2018). "Perfecto mundo 9b+ mission accomplished". Retrieved December 7, 2018. ^ "Adam Ondra makes quick work of Chilam Balam". ClimbingNarc. ^ "Andalusia Dreamin'". Climbing Magazine. Archived from the original on 2011-03-10. ^ "Interview with Adam Ondra after climbing Chilam Balam". Planet Mountain. ^ "Chris Sharma's 'Jumbo Love' (5.15b)". ClimbingNarc. ^ "Jumbo Love". Big Up Productions. ^ "Sharma Redpoints Clark Mountain Project". Archived from the original on September 14, 2008. Retrieved 2008-09-12. ^ "Ethan Pringle Repeats Jumbo Love". Climbing.com. Climbing Magazine. ^ "Andrada Calls New Link-Up 5.15b". Climbing.com. ^ "Adam Ondra Open Air and Hotel Supramonte". Planet Mountain. ^ a b "Alexander Huber interview". Planet Mountain. ^ "Chris Sharma climbs Realization (Biographie extension)!". Camp4. 2006-10-05. Retrieved 2012-01-30. ^ "Action directe" (in German). frankenjura.com. Retrieved 11 June 2013. ^ desnivel.com, ed. (June 25, 2001). "Entrevista a Ben Moon". Retrieved January 23, 2012. ^ "Adam Ondra, the routes I cannot climb!". planetmountain.com. 2015. Retrieved June 11, 2015. ^ "Alexander Megos climbs Hubble. The Raven Tor interview". June 3, 2016. Retrieved August 3, 2017. ^ "Wallstreet" (in German). frankenjura.com. Retrieved June 11, 2013. ^ Patrick Andrey; Andreas Luisier; Mike Tscharner (1997). Fluebible: Kletterführer Basler Jura : Kletterrouten, Boulderprobleme, Eisfälle. Dynamo Productions. ISBN 978-3-9521468-0-4. ^ Up Climbing (ed.). "Margo Hayes, first female 9a+!!". ^ Up Climbing (ed.). "Margo Hayes on La Rambla, first female 9a+ (video)". ^ Planet Mountain (ed.). "Josune Bereziartu climbs first female 9a (interview)". ^ a b "Siegrist Completes Just Do It (5.14c) at Smith". climbing.com. 2012. Retrieved 2 February 2013. ^ planetmountain.com, ed. (December 13, 2007). "Patxi Usobiaga show: Bizi euskaraz primo 8c+ a vista del mondo". Retrieved January 8, 2012. ^ "Adam Ondra, deuxième homme à réussir du 8c+ à vue (édité)". Kairn.com (in French). 8 March 2011. Retrieved 7 October 2012. ^ Ondra, Adam. "List of climbed routes". 8a.nu. Retrieved November 27, 2017. ^ Adam Ondra (November 13, 2018). "Just Do It 8c+ was just an incredible experience". Instagram. Retrieved December 24, 2018. ^ planetmountain.com, ed. (November 12, 2018). "Adam Ondra onsights Just Do It at Smith Rock, America's first 8c+". Retrieved December 24, 2018. ^ "Yuji Hirayama world's first 8c on-sight!". ^ "Kevin Jorgeson sends Ambrosia and blurs line between highball and free solo". ^ "MacLeod solos 5.14b in Spain". ^ "Huber solos 5.14a in Austria". ^ Youtube, ed. (September 8, 2016). "Chris Sharma, The Blonde, 9C". Retrieved August 1, 2017. ^ planetmountain.com, ed. (August 26, 2016). "Chris Sharma in Le Blond project at Oliana". Retrieved August 1, 2017. ^ "Chris Sharma Sends Five-Year 5.15 Deep Water Solo Project". Rock and Ice. September 29, 2016. Retrieved August 1, 2017. ^ "Chris Sharma sends his mega Arch Project in Mallorca - News". FreakClimbing.com. 2006-09-28. Retrieved 2012-01-30. ^ "Reel Rock: King Lines, Part 2". Youtube. September 9, 2014. Retrieved August 1, 2017. ^ Bello, Marisol (January 15, 2015). "Yosemite free-climbers reach top of El Capitan". usatoday.com. ^ Bisharat, Andrew (January 15, 2015). "Summiting Yosemite's Dawn Wall, Climbers Make History". news.nationalgeographic.com. Retrieved 2015-01-15. ^ "Adam Ondra Completes Dawn Wall". Climbing. Retrieved 22 November 2016. ^ Caldwell, Tommy (2008). "Mountain Profile: The Captain". Alpinist. 25: 46–47. ^ Hightower, Elizabeth (4 March 2007). "Climb Like a Girl". New York Times. ^ "Exclusive: Climber Completes the Most Dangerous Rope-Free Ascent Ever". 3 June 2017. ^ Mcphate, Mike (2017-06-06). "California Today: An 'Incomprehensible' Climb in Yosemite". The New York Times. ISSN 0362-4331. Retrieved 2017-06-06. ^ "Video of Alex Honnold's Freerider". ^ "Interview: Nalle Hukkataival - Burden of Dreams (9A bloc)". Relais Vertical. Retrieved 2 September 2017. ^ "Adam Ondra, the pure Gioia interview". Planetmountain. 7 December 2011. Retrieved 1 August 2017. ^ "Adam ondra frees Terranova 8C+". 15 November 2011. Retrieved 1 August 2017. ^ Björn Pohl. "8C+ boulder by Ondra". UKClimbing.com. Retrieved 7 October 2012. ^ "Dave Graham, 'The story of two worlds' his new 8C and his new grading philosophy". FreakClimbing. 19 January 2005. Retrieved 1 August 2017. ^ "Daniel Woods plays The Game Fb8C+". PlanetMountain. 12 February 2010. Retrieved 11 August 2013. ^ "Carlo Traversi repeats The Game (V15) in boulder canyon". Climbing Narc. March 12, 2011. Retrieved 1 August 2017. ^ "Carlo Traversi Sends The Game (V15/16)". DPM Climbing. 12 March 2011. Retrieved 11 August 2013. ^ "Lucid Dreaming, new extreme boulder problem at the Buttermilks, Bishop". PlanetMountain. 31 March 2010. Retrieved 11 August 2013. ^ "Daniel Woods Does Repeat Lucid Dreaming". Climbing Narcissist. 28 January 2014. Retrieved 30 January 2014. ^ "Hardest boulder problems". 99boulders. October 26, 2016. Retrieved August 1, 2017. ^ a b "The classics - Dreamtime". Mammut Magazine. July 5, 2017. Retrieved August 1, 2017. ^ Corey Rich (August 2008). "Yosemite in 3-D". National Geographic. Retrieved 9 May 2013. ^ Sam Moses (2 June 1986). "On The Rocks, Kauk Is It". Sport Illustrated. Retrieved 9 May 2013. ^ "Midnight Lightning - Mountain Project". ^ "Midnight Lightning bolt, the icon of free climbing in Yosemite disappears for a day". planetmountain.com. 7 May 2013. Retrieved 9 May 2013. Maurizio Oviglia (December 21, 2012). "The evolution of free climbing" (in Italian). Planet Mountain. "Hardest boulder problems". 99boulders. October 26, 2016. Retrieved August 1, 2017. This page was last edited on 10 April 2019, at 22:55 (UTC).